The ‘local’ Russian story concerns yet another ‘two Ks’, Karjakin and his older rival, ex-World Champion Vladimir Kramnik. 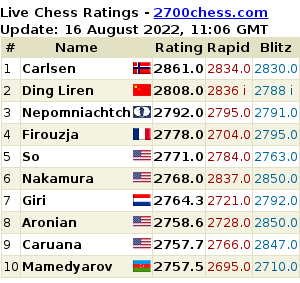 Karjakin has now edged ahead of Kramnik on the FIDE rating list (with 2788 compared to 2781), and will have learned from acting as Kramnik’s second in Kazan. When Karjakin complains in the interview below about the dates of the Russian Championship Superfinal being changed without considering the interests of all the players… the unspoken detail is that they appear to have been changed to allow Kramnik to take part for the first time in years (as I mentioned at the bottom of this recent Morozevich interview). The original dates in December would have conflicted with the London Chess Classic. Will a time soon come when the Russian Chess Federation will put Karjakin first, as the best hope for a World Championship title? Sergey, after the recent Candidates Matches in Kazan the winner, Boris Gelfand, told me that he treated the rating system with considerable scepticism – saying that the fact that someone currently has a few more rating points on the table doesn’t mean that he plays better. Everything might be different tomorrow. What’s your personal opinion on that system? It seems to me that the FIDE rating system is an objective reflection of a player’s strength. It’s another matter that in a particular game the person who wins is the one playing better at that given moment and not the one with the higher rating. Two years ago, when you moved from Simferopol [Ukraine] to Moscow and changed both your citizenship and federation, you were 23rd on the rating list. Now you’re fourth in the world. Did you expect to make such quick progress? That’s the result of productive work with my coaches – Yury Rafailovich Dohoyan and Alexander Motylev. In two years I’ve managed to achieve a lot and now I need to consolidate at the new level. I remember once, when Topalov and Kasparov shared first place at a tournament in Amsterdam, that Veselin, who had the better tiebreakers, told me: “Garry and I shared the prize money, but ultimately my surname will be on top”. At the tournament in Bazna you scored as many points as Carlsen, but in the end Magnus had a 0.25 points higher Berger coefficient and was named the winner, with you second. Was the prize money at least divided in half?! The difference between the prizes was only symbolic, but that’s not the main thing. In general, I think those additional tiebreakers are a bad thing in round-robin tournaments. If two people score the same number of points then they should be joint winners, the way it’s almost always been done, for example, in Wijk aan Zee. I also expressed that opinion after the Tal Memorial, where the coefficient worked more in my favour, so it would be hard to accuse me of bias. Well, and if there absolutely must be one winner, as was the case, for example, in the Russian Championship Superfinal, then you need to play a tiebreak. 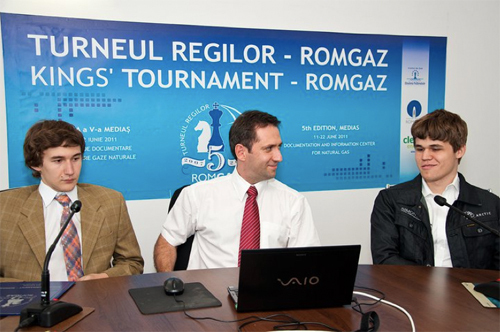 Your rivalry with Carlsen has now become the focus of particular attention. Do you think you can also compete with him in other events? Besides Carlsen you’ve also got Anand, and Aronian, never mind other chess players. Therefore I’m concentrating on trying to improve my own game. As for Magnus, in Bazna I managed to score the same number of points as him, so I think I can compete, but for that I need to do a lot of work. You helped Vladimir Kramnik in the Candidates Matches in Kazan. Why do you think the ex-World Champion was unable to win a single game at the classical time control – either against Radjabov or against Grischuk? Kramnik had no problems with Black, but with White his opponents chose the most solid variations, where they were well-prepared. Perhaps at some point Vladimir needed to play more sharply, to take a few risks. However, given the format, where you can be knocked out after a single mistake, it’s hard to demand bold play from the players. Do you think the system for deciding the challenger used in Kazan, where different forms of chess were combined and consequently a series of matches were decided in blitz, was a good one? Perhaps it would be more interesting for the spectators to watch a round-robin tournament, but then the problem of people throwing games would be a very serious one, particularly if a player lost any hope right at the start. I think the match system is perfectly viable and fair, but you need to play more games. In a match with 6-8 games the weaker player will find it much more difficult to “survive” to the tiebreak, and the stronger one will almost always win. That’s also a problem at the World Cup in Khanty-Mansiysk, where only two games are played, and if it goes to tiebreaks then the winner is the person with the better nerves rather than the one who’s better at playing chess. Do you think Boris Gelfand’s victory in Kazan was a fair reflection of play, or was it achieved thanks to a favourable combination of circumstances for the Israeli grandmaster? Gelfand’s victory was absolutely deserved! I’m embarrassed to say that I still haven’t congratulated him, so I’d like to take the opportunity to do it now via Sport Express! Gelfand played better than everyone else, and managed to win two matches in normal time! For me personally, it was his composure that made the greatest impression. When the semifinals reached the tiebreaks Zahar Efimenko and I would enter the playing hall during breaks to give some advice to our “protégé”. Gelfand lost to Kamsky in the first 25-minute game with White and had to win on demand with Black. It hardly needs saying that that’s an almost an impossible task! But I was stunned that Boris, in contrast to his apparently highly-stressed colleagues, kept perfectly calm and was even telling us jokes! In the end his nerves turned out to be stronger than Kamsky’s and Gelfand managed not only to win on demand with Black, but also to outplay Gata in blitz and reach the final. Do you think you’re already playing better than Kramnik, or is Vladimir still a little stronger? We’ve both got our advantages. I’m younger, and perhaps therefore I’ve got more stamina. Kramnik’s got enormous experience, and that baggage of knowledge that he’s built up over his career is superior to my own knowledge. That made it all the more interesting to work with him in Kazan! If, at the World Team Championship in China that starts on 16 July, you’re offered the chance to lead the Russian team, would you agree? Or would you prefer it if the burden of leadership fell on one of your teammates? First board is a real honour, and carries with it great responsibility. But if they suggest it then I’d be delighted to accept! The team line-up in terms of boards will be decided by the team’s head coach, Evgeny Ilgizovich Bareev, so we’ll see what he decides. You’ve mainly been accompanied at the latest tournaments by Alexander Motylev – are you working with him more now than with Yury Dohoyan? Tournaments are, as they say, only the tip of the iceberg. The majority of work takes place at training sessions. I spend an approximately equal amount of time working with both of them. I wouldn’t want to single anyone out, as they’ve both done and are doing a great deal to improve my chess! This autumn the schedule of events at the very highest level is going to be extremely packed. The Superfinal of the Russian Championship, in which Kramnik is intending to play, has now been moved to August. How are you planning on allocating your efforts? The schedule’s very tight. The World Team Championship’s coming up, then the Superfinal, the World Cup in Khanty-Mansiysk and the Grand Slam Final in Spain. I’ve got more invitations, but perhaps I’ll have to reject some of them. Moving the Superfinal to August means that my schedule, which was already busy, has now become as packed as it could be. In August I was planning to prepare for the World Cup, but now, as I’m playing in the Superfinal, I’ll have to sacrifice a significant part of my preparation. The situation’s worked out the same with the Women’s Superfinal. Because of the packed schedule the Kosintseva sisters have had to withdraw from it completely. In future when there are decisions as important as moving a tournament I’d like the management to approach things more carefully, taking the interests of all the participants into account. What do you think about discussions on the “decline of classical chess”? I think classical chess still has resources and hasn’t yet been exhausted. Just look, for example, at the tournament in Bazna: the number of decisive games was very high! It all depends on the format of the event. Would you play Fischer Random Chess? And what do you think about the idea of a universal reduction in the time control? Fischer Random Chess is a great game! Creativity starts from the very first moves. If tournaments were held using it then I’d be happy to take part. While it’s sometimes interesting to play with reduced time controls, rapid and blitz still shouldn’t squeeze out classical chess. For example, in Bazna I managed to win a beautiful game against Ivanchuk, but if I’d played that game in rapid chess I wouldn’t have found the winning combination. The quality of play suffers in rapid chess, and there’s nothing you can do about that. 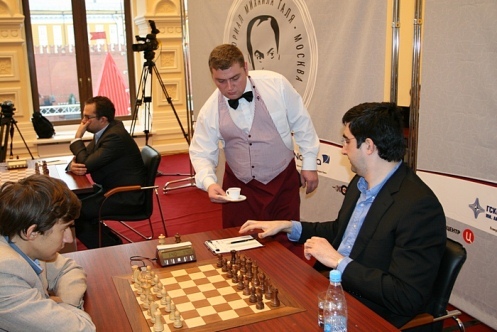 In Kazan you helped Kramnik along with Zahar Efimenko, who just won “silver” at the Ukrainian Championship. How do you get on with your old colleagues on the Ukrainian team? We get on well. They all understood my reasons for switching, and no-one took offence. Zahar and I had things to talk about in Kazan, and things to recall. By the way, he was best man at my wedding, so there’s no problem with our relationship! Does it help you that your wife, Katya Dolzhikova, is a chess player? Do you talk about chess at home with her? Katya knows the specifics of chess, and understands why I often can’t be at home. We talk about chess, of course, as it takes up a significant part of our life. I remember last year at the ACP World Rapid Cup when I lost the first game with White to Grischuk, after which I told my wife: “That’s it, you can start packing”. Katya replied, however: “It’s not over yet!” She instilled confidence in me, and in the end I managed to win! Her support means a great deal to me. How do you spend your time in Moscow? Is there any left for cultural activities? Do you manage to go anywhere with your wife – to the theatre or to concerts? Have you been in the Pushkin or Tretyakov Museums? Katya and I complement each other in that regard. I prefer the cinema, different types of bowling, billiards, while she often takes me along to concerts which, by the way, I also enjoy. I visited the Tretyakov after my unsuccessful tiebreak against Nepomniachtchi in the Superfinal. I needed to forget about it as soon as possible, and decided to go to the museum (smiles). Two years ago you said your goal was to win the World Championship title. Are you closer now, or is it still a long way off? It’s closer now, of course, above all because I’m already fourth in the world! Now I “only” have to conquer three more steps (laughs). Thanks. 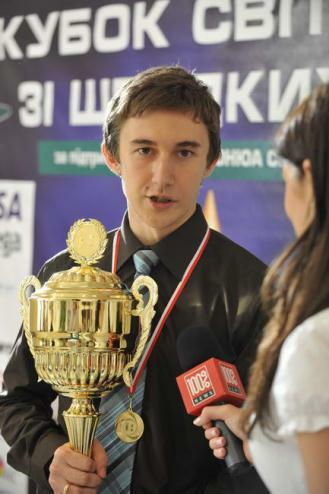 Karjakin seems very sensible and level-headed. I hope he achieves even more great things in the future! I somehow think he means the (other) game, the one he won with the black pieces. Good point, Thomas! I’d forgotten about that game, and as far as I remember he took much longer thinking about the combination there. Anyway, I’ve now included both games. Bit funny that he earned his place at all the tournaments: Bilbao at Bazna, RusCh by finishing 1/2 last year and I assume the worldcup as well by reaching the final in the last edition. Off-topic but re: your post on WhyChess, just some info – Chennai is the new name (or old old name) of Madras – which is where the Anand-Dreev match was held in 1991. So full circle ! It seems to have been confirmed the Chennai bid is only that – a bid, by the way. The Indian media got a bit carried away. As for most of the rest of the Indian media, they might as well be reporting about baseball. The Nielsen/Carlsen mixup is one recent example. The other more glaring incident was when a completely ignorant guy was interviewing Anand’s dad for a leading TV channel – and was asking “What do you think about Vishy’s victory!” etc. That was so completely unforgivable for a local guy. Sorry if this is profound naivete, but I would not have imagined that people throwing games could be a problem at that level.